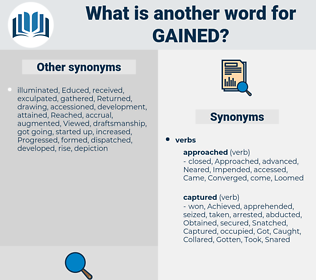 What is another word for Gained? 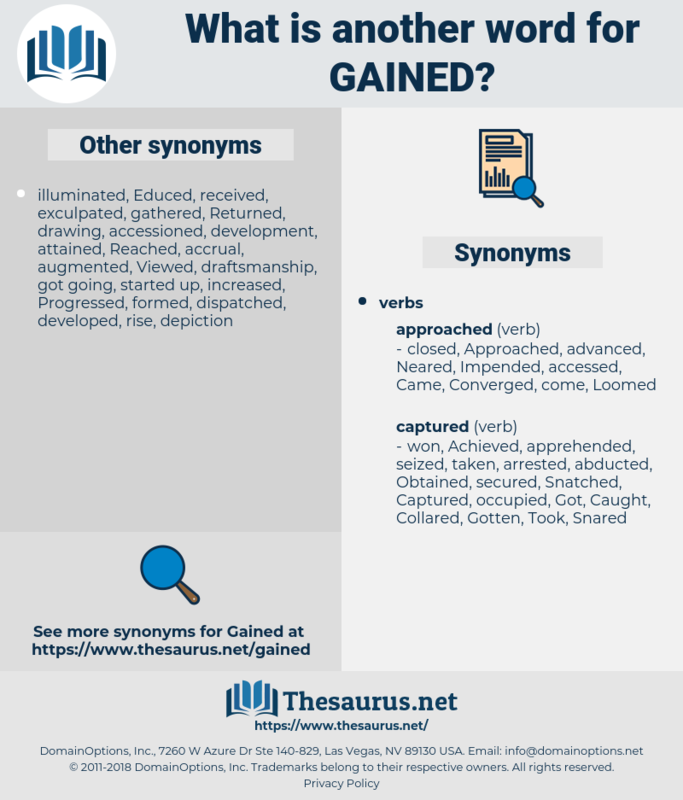 Profited, obtain, Obtained, Obtaining, increase, increased, rise, rose. attained, Garnered, maintained, retained, Generated, gathered, contained, Investigated, Progressed, Participated, engaged, strengthened, initiated, arranged, Enjoyed, Heightened, Managed, enhanced, experienced, improved, re-established, Caught, implemented, Reaped, Attracted, confiscated, accumulated, Brought, established, intensified, expanded, derived, discovered, Extracted, Incurred, Surged, facilitated, joined, recovered, appreciated, qualified, Learnt, Averaged, collected, recognized, identified, Introduced, seized, conquered, Emerged, Contributed, Succeeded, exacerbated, Ranged, Retrieved, Grabbed, understood, Withdrew, conferred, deprived, Persuaded, recaptured, invested, elicited, Widened, Procured, Boosted, Delivered, enlisted, augmented, perceived, registered, Captured, included, outcome, stole, Suffered, Prevailed, possessed, Recuperated, found, rebounded, accepted, ensured, invited, restored, approved, built, Undertook, charged, right, Underwent, failed, clinched, Arrived, defeated, Yielded, removed, Provided, determined, assembled, Climbed, Entered, Grew, Mobilized, realized, consumed, promulgated, licensed, Enacted, Hiked, ali, endorsed, save, collection, assumed, Consented, concluded, Issued, Instituted, agreed, staged, mistake, Encountered, deserved, owned, allocated, landed, cost, finished, saved, Allowed, realised, Submitted, raised, licence, attended, addressed, occupied, fell, Bagged, Performed, Claimed, produced, edged, Weighed, Rendered, conducted, enrolled, drew, Weights, completed, swelled, Gave, permitted, Inched, Scanned, recorded, escaped, sought, Acceded, Computed, hired, revealed, Prevented, committed, graduated, merited, briefed, recouped, lifted, pursued, Happened, noted, Picked, donated, command, Commanded, led, dipped, added, permeated, Raked, pointed, Bounced, broke, scaled, taught, notched, Jumped, proved, beat, Deposited, Pushed, presented, swept, observed, dropped, Droit, spread, exits, Reached, moved, Tallied, lf, adopted, Killed, Exceeded, opened, Launched, Stood, Regarded, fulfilled, played, Slid, Came, Returned, build-up, HIT, retired, Occurred, sat, Prompted, Approached, Bought, Carried, Passed, Resulted, Rocketed, laid, cleared, Proceeded, turned, ended, used, Lived, Awarded, traded, Rated, drove, Took, Served, decided, spent, Amounted, heard, Caused, shaved, Filed, tested, Offered, effected, pray, wanted, Helped, reflected, saw, marked, firmed, Had, satisfied, read, stuck, Scored, wrought, Worked, Went, Complied, Raced, Hauled, Tended, topped, Levied, touched, fired, studied, Got, Hopped, Resumed, shot, Totalled, ate, Accounted, expressed, struck, Responded, packed, locked, Looked, covered, hosted, booked, tried, showed, kept, Dealt, posted, considered, headed, Popped, pulled, formed, placed, put, thought, Ran, Voted, Acted, 225, Did, Met, made, acquired, learned. regained, attained, Garnered, maintained, benefitted, Benefited, retained, assigned, Generated, Negotiated, ascertained, integrated, advantageous, gathered, contained, incorporated, consolidated, Investigated, grandfathered, Progressed, trained, Detained, Participated, guaranteed, Engendered, engaged, strengthened, initiated, arranged, leveraged, Begun, Enjoyed, Materialized, Heightened, Gleaned, experience, Managed, enhanced, experienced, improved, GOTTA, acknowledged, Declined, Penetrated, Caught, transmitted, implemented, entitled, demonstrated, Influenced, Reaped, Attracted, reclaimed, Communicated, Disappeared, accumulated, Brought, established, reacquired, recognised, stimulated, inherited, outcomes, interpreted, intensified, expanded, derived, discovered, Extracted, learn, convinced, Incurred, Surged, facilitated, tightened, joined, recovered, Constructed, qualified, motivated, Attributed, Learnt, associated, accomplished, inspired, conspicuous, induced, Replicated, succeed, reinforced, collected, recognized, identified, Introduced, lost, seized, exploited, conquered, Emerged, Contributed, Succeeded, Enriched, informed, awakened, withdrawn, manufactured, impressed, discontinued, Retrieved, Grabbed, imprisoned, understood, conferred, Persuaded, downloaded, recaptured, triggered, reported, elicited, Widened, Bolstered, Procured, Remained, amassed, Entailed, Delivered, stolen, augmented, Liquidated, appropriated, perceived, Delegated, registered, Enshrined, Captured, included, Canvassed, Examined, Created, Suffered, Prevailed, absorbed, highlighted, possessed, found, accepted, ensured, Coined, Dragged, Undertaken, isolated, Undergone, restored, deepened, approved, insured, built, charged, failed, Arrived, Availed, admitted, relevance, supported, stockpiled, Yielded, aroused, removed, upgraded, involved, Provided, calculated, convention, Construed, grown, depressed, determined, assembled, Climbed, provoked, Entered, assisted, discharged, bestowed, located, prescribed, Mobilized, realized, consumed, Compiled, measured, renamed, Collated, promulgated, licensed, Exercised, Enacted, Hiked, advised, prepared, furnished, ali, sparked, Lagged, escalated, assumed, witnessed, concluded, infected, grasped, Issued, mistaken, mobilised, Instituted, agreed, evacuated, Extorted, Encountered, deserved, owned, allocated, spoken, Harvested, overcome, documented, cost, spiked, finished, reunited, Afforded, saved, fostered, Allowed, realised, raised, Promoted, utilized, formulated, attended, excited, entrusted, Assessed, addressed, contracted, fallen, warranted, imposed, preserved, Performed, Claimed, produced, carved, forfeit, forfeited, drawn, left, Rewarded, allotted, Rendered, Embarked, conducted, ranked, arrested, given, completed, pledged, permitted, executed, verified, Evolved, Adhered, recorded, repeated, sought, Acceded, Computed, thanks, hired, revealed, Prevented, selected, committed, graduated, merited, connected, mastered, lifted, Spurred, pursued, Happened, treated, noted, Attacked, Picked, donated, trapped, Lured, broken, imported, Convened, Commanded, led, crafted, added, assured, Deleted, directed, pointed, Arisen, extended, composed, employed, Operated, taught, Jumped, bound, framework, applied, proved, proven, modified, beaten, Devised, Borrowed, Pushed, Reverted, tracked, serviced, Subjected, swept, observed, dropped, pronounced, paid, linked, matured, equipped, lent, attached, spread, exits, Reached, Logged, sent, moved, born, Borne, lf, adopted, Killed, known, opened, specified, Launched, forged, certified, Regarded, fulfilled, played, Been, recalled, Returned, Levelled, HIT, Supplied, stopped, evoked, honoured, retired, come, Occurred, Ticked, scheduled, traced, elected, Chalked, Prompted, Bought, Carried, Passed, Resulted, laid, driven, credited, sampled, listed, taken, turned, travelled, Revoked, sold, Bred, used, chosen, Quoted, looted, printed, trimmed, Lived, Awarded, shouldered, Rated, mined, Answered, Served, Stayed, spent, started, heard, Believed, Caused, Accorded, tested, crowned, Offered, seen, fed, founded, effected, blown, aged, Fared, sourced, Helped, reflected, Tackled, related, Watched, marked, solved, resolved, Had, satisfied, cashed, stuck, Exacted, Scored, Worked, shaped, Complied, Polled, tied, get, Gotten, firing, rolled, Levied, Viewed, fired, eaten, faced, Got, Resumed, shot, settled, Towed, Accounted, expressed, struck, chopped, opted, Responded, packed, locked, Looked, stored, covered, gone, posed, booked, tried, Stepped, fuelled, Told, Echoed, kept, Dealt, felt, devoted, posted, considered, Modelled, headed, pulled, Shown, formed, funded, placed, put, thought, focused, Acted, cut, based, Met, made, done, earned, acquired, learned. Benefited, won, Achieved, Achieving, earned. Thus almost everything which had been gained was utterly and for ever lost. ghanian, gemma, gascogne, gehenna, ghana, guama, gnomon, gammy, gamin, gen, go home, guinea hen, goony, gamy, genuine, gismo, gamma, genu, gaussian, gonne, gazania, goonie, go in, gum, go on, gown, gonion, gun, gascony, gay man, gizmo, guanine, Gam, gagman, gym, guaiacum, guggenheim, gnaw, goose skin, gene, gem, gamine, gynne, gnome, genome, Goma, gaskin, geum, gumma, gwynn, gamey, genoa, gamow, gm, guiana, Genie, gemini, guinean, gas gun, g-man, ghanaian, guan, gawain, guam, gean, gum anime, gooney, gauguin, game, gas main, guyana, go game, gwyn, gone, guano, goujon, gammon, guinea, goon, gay woman, ganoin, gummy, ganoine, gywn, gin, gnu, gunman, gasman, gunny, guenon.